Today’s Asparagus Salad with Lemon Vinaigrette is full of the flavors of spring and perfect for brunch, lunch, or dinner. And best of all it is delicious and naturally gluten-free! I love Caprese salad, an Italian classic with heirloom tomatoes, mozzarella cheese and fresh basil. These three ingredients represent the colors of the Italian flag and are often found in a variety of dishes, most notably this salad and Margherita pizza. 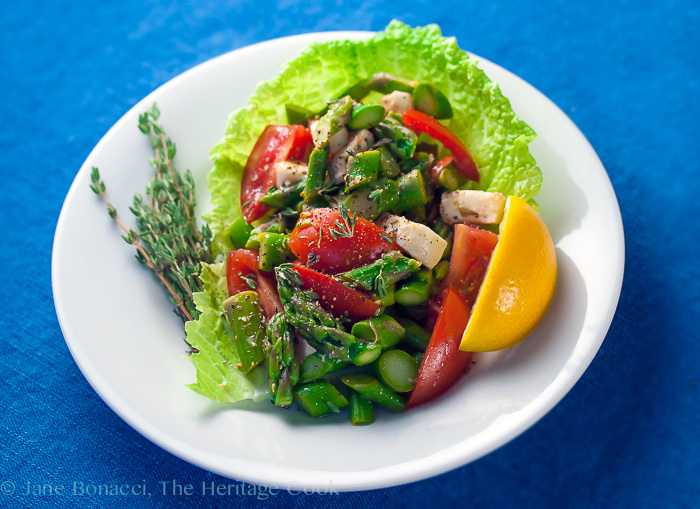 Today’s recipe replaces the basil leaves with fresh asparagus to celebrate the spring harvest. If tomatoes aren’t at their peak, it’s OK because marinating them for a few minutes in the vinaigrette gives them a huge bump in flavor. You can use any variety you like, but heirlooms are my personal favorite. When they aren’t in season, I usually buy Roma tomatoes (pear-shaped) because they have a lot of meat, few seeds and less moisture. That makes them perfect for most salads. If you can’t find asparagus in the grocery store or farmer’s market, you can substitute zucchini, cucumber, crookneck squash, potatoes, or other vegetables you like for an equally delightful dish. This lets you make a version of it all year long! You can throw this salad together in just a few minutes and have it on the table in less than an hour. The Artist and I really enjoyed this Asparagus Salad with Lemon Vinaigrette. We added a rotisserie chicken to round out the meal and it was absolutely perfect! Welcome to Progressive Eats, our virtual version of a progressive dinner party where each course is held at a different home. With Progressive Eats, a theme is chosen each month, members share recipes suitable for a delicious meal or party, and you can hop from blog to blog to check them out. This month’s theme is Citrus and is hosted by Laura of Mother Would Know. Each recipe in our menu this month features citrus in some form: slices of fruit, juice, rind etc. We have a great mix of recipes for you to enjoy. See the links below for inspiration and great recipes! The best way to know where to cut asparagus (part of the stalk is tough and woody) is to hold one stalk at both ends and bend it until it snaps in two. Set the tender stalk next to the rest of the bunch and cut them all to that length. This salad is naturally gluten-free. If you choose to use a store bought dressing, make sure you read the label and be certain it doesn’t have any gluten in it. Dressing are one place where gluten likes to hide! Fill a large mixing bowl about half full with water and add ice to use to shock the asparagus and stop the cooking. In a 4-quart saucepan, bring water to a boil, salt it lightly and add the asparagus. Cook until the asparagus is just barely tender, about 4 minutes. The cooking time will depend on the size of the pieces. Nibble on pieces, testing until they reach the doneness you like. Using a slotted spoon transfer the asparagus to a wire strainer. Place the wire strainer in the bowl of ice water – the strainer will make it much easier to strain the chilled asparagus. Leave in the water just long enough to stop the cooking process. When lightly cooled, lift the strainer with the asparagus from the water and drain thoroughly. Transfer to another mixing bowl. Add the tomato wedges* and mozzarella cubes. Sprinkle with the thyme. Set aside while you make the vinaigrette. In a medium jar with a tight lid, combine the lemon juice, vinegar and shallots. Let it sit and macerate for about 3 minutes. This will take a little of the sharpness off the vinegar and lightly sweeten the vinaigrette. Add the remaining vinaigrette ingredients. Place the lid on the jar, tighten it and shake the jar vigorously until the mixture is smooth and emulsified. Pour 1/3 to 1/2 of this mixture over the salad and toss until everything is evenly coated. Add more if you like. Taste the salad and add salt and pepper to taste. Pass the extra dressing at the table and then store remaining dressing in the refrigerator up to a week. Place a lettuce leaf on each serving plate. Divide the salad evenly between the plates, placing it atop the lettuce leaves. Serve immediately. * If your tomatoes are not full of flavor, toss separately with some of the vinaigrette and let sit for about 5 minutes. Then use a slotted spoon to transfer the tomatoes to the bowl with the cheese and asparagus and continue making the salad as directed. You can use the dressing that was on the tomatoes to dress the rest of the salad. My asparagus salad wants to meet your asparagus salad. I think they would get along really well. This is lovely and I adore all of your suggested substitutions. Just lovely Jane. Thanks so much Beth ~ I’m sure our salads would both get along beautifully! I love your spin on similar ingredients, so clever!! Your photos are amazing, and that salad looks delicious! I love finding new ways to use asparagus. You are too kind Coleen, thank you. Sometimes we get stuck making the same dishes over and over. I’m happy to have a nudge to make something different each month! This salad is so lovely and definitely perfect for spring! It’s the way I love to enjoy asparagus the most with it being the center of attention! Can’t wait to try! Thank you Carol – I love to showcase asparagus too! I hope you enjoy it! What a wonderfully flexible salad! And it’s perfect for spring. I was in the Bay Area last week, and it was gloriously spring. Not quite there yet in the mountain though. But I’m going to get some asparagus and make this over the weekend! We are very lucky to have such beautiful weather here, but you’ll warm up soon too. I hope you enjoy this – the asparagus is so beautiful right now! Gorgeous salad! I’ve got some asparagus in my fridge that needs a recipe. I think I’ve found it! I hope you love it Karen – we sure did! There is nothing like a salad with colorful veggies to make me think of spring. Even though it’s cold and drizzly here today, I’m looking at this gorgeous salad and dreaming of how my asparagus will look nestled in with tomatoes and cheese. Plus that vinaigrette is the perfect way to dress this “Italian flag” dish. I hope the warmer weather arrives soon for you Laura! I know you will love this salad when everything comes into season! I think asparagus goes perfectly with tomatoes and mozzarella – and I agree, this is such a fabulous summer lunch salad! I love lemon vinaigrette (though I might be tempted to add just a touch of orange to it hahaha). This is really a gorgeous treat! Of course you would add orange, like right out of Orange Appeal, and it would be fabulous!! I love this combo of veggies and cheese! So many favorites in one yummy salad! And your lemon vinaigrette sounds divine!! Thanks Liz, the lemon vinaigrette is so good on any salad!